HEY Backpackers consists of the two buildings(HEY1 and HEY2) located on both sides of the musick show 'Wedding' theatre, a big-windowed 'ALAND' building. It takes just 10 seconds(30m) between both sides of the building. You can visit both two building and use the facillities of both. Located in the middle of the Hongdae area(Hongik Univ. Stn.) which is the most cost-effective way to get around Seoul, we are surrounded by the numerous cafes, clubs, bars, restaurants, boutiques and Art free marget Playground Park (90m), Tourist Information Center(110m) and extremely close to airport bus(60m) & subway St.(200m) and the musick show 'Wedding' theatre(just 1m). HEY Backpackers is a place where guests can stay as home-stay and can have friendly service and enjoy the maximum comfort & Korean cultural experience at an incredibly low price. We are situated in the middle of the best attractions, plays, musicals, dining, and nightlife that in the middle of Hongdae area has to offer. Relax and feel the youthful vitality in comfortable cafe/bar/club/playground with many new young friend around us. There is always a great range of food and drinks available at reasonable prices. We offer guests a warm, friendly, clean, comfortable place and a safe & fun environment to stay and make it easy to meet other cool travelers, with spacious dorms, a selection of chill out areas, and a variety of group activities on offer at great prices for your trip to Seoul, in a very convenient location, where travellers feel at home. The host is a mix of travelers and true Seoul-siders who know the best places to party, eat, travel, see and experience. With HEY Backpackers as your base you'll easily be able to see all what Seoul has to offer by day and soak up the nightlife, whatever your style. - We have a clean fully equipped kitchen, a big living room with HD TV & computers, free Wi-Fi & internet access, free bed Linen, free Laundry facilities and security Lockers, automatic heating control system called Ondol and A/C. The check in time is after 1 pm but If you arrive at the HEY Backpackers too early in the morning, can stay in the living room or keep your luggages in the living room first and then go back to check in later(after 1 pm). If your room is vacancy at that time, you can take your room early in the morning. The room check out time is before pm12 but you can stay a little longer depending on the situation and after you leave your luggage in the storage space or living room, can stay in the living room and check out until evening (Free of charge). We have the 3rd terrace and a big living room with HD TV & computers that gives a place for the comfortable conversation with other travellers and the musick show 'Wedding' theatre is located in front of this, Art free market Playground Park located in just 40 second by walking from this. = Tour Reservation service : We reserve tours of Korea's Demilitarized zone(DMZ), Panmunjeom(JSA), Daily City Tour & Cultural Tour, Ski Tour, 'Wedding' & 'NANTA' Performance(20% Discount), etc and offers free pick-up service for tour in front of this through the Host as well. = Guide Meeting service : We provide program called guide meeting. You can have a chance to meet young, enthusiastic Korean guide who very like to meet foreigners and go travel together. All travel costs are share with guide like friend. Once you make a booking, we will send you full details/website about different building & this by e-mail so you can directly go there or we can take you there from here. And you can visit both the building and use the facillities of both. Hongdae(Hongik Univ.) 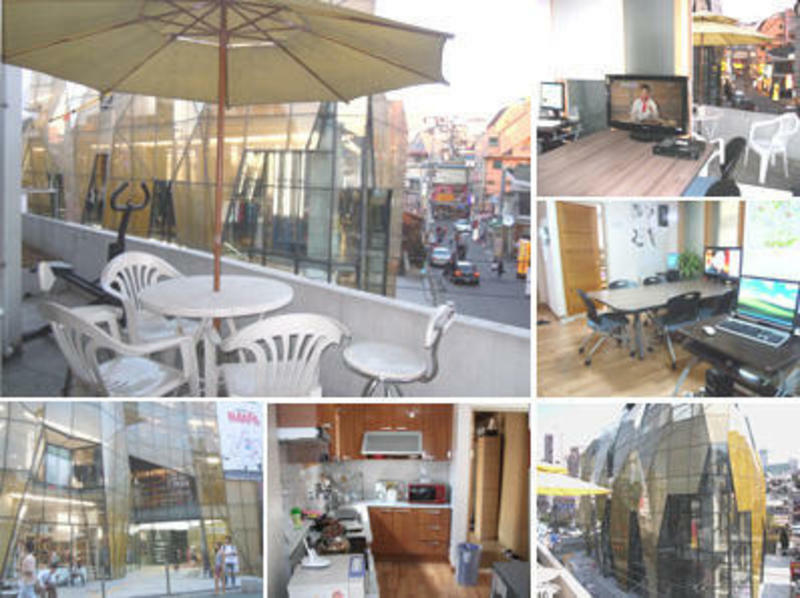 Area, famous for its are program, is within an easy walking distance of Sinchon Yeonsei and Ewha Woman's Univ. area, extending the field of youthful energy. Small theaters and Clubs create an attractive underground culture. The art students bring ther work to the streets in an outdoor are festival. Impromptu street performances are also a common sight. Clubs : Hongdae Area and its neighboring clubs are brothers and sisters. The clubs are the source of youth. At the last Friday of the month, Club Day attacts more patrons, since a 10,000~15,000won ticket allows you to get in hip-bop and independent music clubs. And the Clubs are located in just 20~60 second & Playground Park 40 second by walking from this and 'Wedding' theatre is located in front of HEY Backpackers. !!! You will meet all kinds of exciting friends !!! You'll see too many young people on your way here and can find very easy. 1. Cross the the crosswalk toward the 'MARIGOLD' Hotel, then keep walking straight up(about 60m) until just before the musick show 'Wedding' theatre of the narrow road between the'Traditional Hanbok Shop(Korean traditional clothes)' and the 'Ginseng Chicken Soup' black building. 2. We are on the left side-corner just before(next) the musick show 'Wedding' theatre, a big-windowed 'ALAND' building (The 'Wedding' theatre is at the opposite-top side and the 'CU' Mart is at the opposite-right side). 1. From Incheon Airport take the train. 2. Stop at the Hongik Univ. Stn. (A03) (It takes about 47 minutes and the train runs every 12 minutes ; fare /3,750 KRW) and go to Exit No.9. 1. Go straight ahead toward an intersection(30m), cross the crosswalk and keep walking (20m) toward the 'Seokyo' Hotel, then pass the Hotel and walk straight ahead more(30m). 2. Turn left at the 1st narrow road between the 'Traditional Hanbok Shop(Korean traditional clothes)' and the 'Ginseng Chicken Soup' black building before the 'MARIGOLD' Hotel, then go straight up (about 60m) until just before the musick show 'Wedding' theatre. 3. We are on the left side-corner just before(next) the musick show 'Wedding' theatre, a big-windowed 'ALAND' building(The 'Wedding' theatre is at the opposite-top side and the 'CU' Mart is at the opposite-right side). Once you make a booking, we will send you full details & website.